Rev. 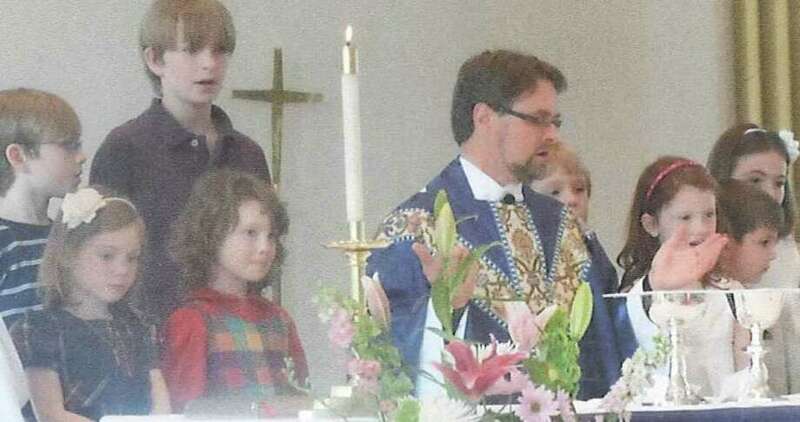 Matthew Calkins of St. Timothy’s Episcopal Church in Fairfield with children of the congregation. Padre Raphael, a friend and fellow priest from Cartagena, Colombia, sent me a biblical verse recently. It was from the second chapter of the gospel according to Luke and describes the aged Simeon speaking to Mary and Joseph about the baby boy they have brought for presentation at the temple. After praising God for allowing him to see the child he believes is destined to be the salvation of Israel and a light of revelation for the world, he predicts that the child's appearance will be a sign opposed by many, a revelation of their inner thoughts -- and a sword that will pierce the heart of his mother as well. Not every divine gift comes without a cost. Christians around the world celebrated the birthday of Jesus Christ on Dec. 25. But you may have missed amid the seasonal celebrations the Feast of the Innocents on Dec. 28, marking the day that King Herod ordered the execution of the young boys in Bethlehem in an attempt to avert the prophecy that a new king would be born there. The magi from the east had alerted him to the star in the sky; his response was to oppose the sign with violence. How is it that the coming of the Prince of Peace brought soldiers to slaughter innocent children? My friends in Cartagena are emerging from a long civil war and a continuing struggle against drug lords and poverty. In this beautiful city along the Caribbean coast, tourists come to escape northern winters, while in the neighborhoods spreading along the hillside, children often have little to eat, let alone celebrate this season. Needless to say, you don't have to travel so far to find the same story. Bridgeport will do. Why is there such disparity in life's opportunities among the children of the world? As we enter the new year, let us resolve at least two things: One, every child is a gift from God to be treasured and raised with love and hope; our top priority is their future. Secondly, however divided we may be around issues of faith, however diverse our beliefs about God and the mysterious course of providence and the human heart, let us refrain from violence in the name of God. The answers to the questions I posed above are not that difficult to find. Lust for power, greed, tribalism: These are ingrained in human nature and aggravate the inequalities of history and the material world. It does not take a miracle to bring them out; it takes one to put them aside. Let us then search our hearts, as Simeon said, and respond to the gifts of God with compassion, generosity and wisdom. And let the price we pay for the gifts of God be thanksgiving and renewed striving for peace and justice. HISTORY: Founded as a mission chapel in 1964, established as a parish in 1968, St. Timothy's is a member of the Episcopal Church, part of the Anglican Communion of churches. SERVICE OPPORTUNITIES: Millennium Development Goals, Global Child Survival Act.